Yesterday I filled out my Kentucky state sales taxes for the year and realized just how few bears were created in 2012! There were many reasons for this - going back to work full time after 10 years, getting into a fabulous new relationship, changing jobs and moving yet again . This year . 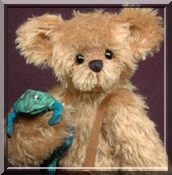 my goal will be to create more bears in 2013 I am really looking forward to doing that anyways as I never feel quite satisfied unless I am creating . First Critter of 2013 - Lucky! I hope you all enjoyed the holidays. They've been busy ones for us. I'd like to introduce you to the first critter of 2013 - Lucky! He was created out of light tan curly matted mohair with a dark backing. He is fully jointed, but designed to sit. Sitting he's 4 1/2" tall to the top of his head, not counting his ears. He has a hand stitched black nose and dark cocoa brown inner ears. He's filled with fiberfil and quite a bit of steel shot for a nice heavy feel. Lucky is fully potty trained and ready to find his new "forever home"
Lucky's adoption fee is $85 plus shipping. "pawtrait" session, he is available today for 10% off!